In this Topical Zoom episode, I speak with Hannah Chaplin, CEO & Co-founder of Receptive, a Product Demand Intelligence for SaaS companies, about data and customer feedback. 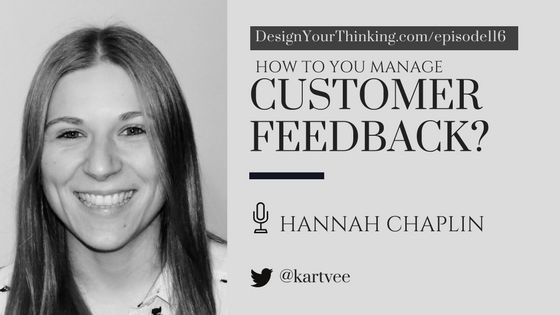 strategies to manage customer feedback. Can you give our listeners a quick background about yourself? Firstly, it seems like everyone wants data. As Product Managers we have multiple touch points with people and tools. We are also constantly making decisions. How do you look at data and decision making? As Product Managers, we soon end up getting a competing set of tasks and other activities that are vying for our attention. How do you personally prioritize at work? Let’s maybe keep it specific to customer feedback. How have you seen the best teams do this? Have you learnt something new? Finally, data can get pretty darn messy if we don’t handle it well. Customer feedback is no less. Can you talk about the best ways to manage the data generated by customer feedback?